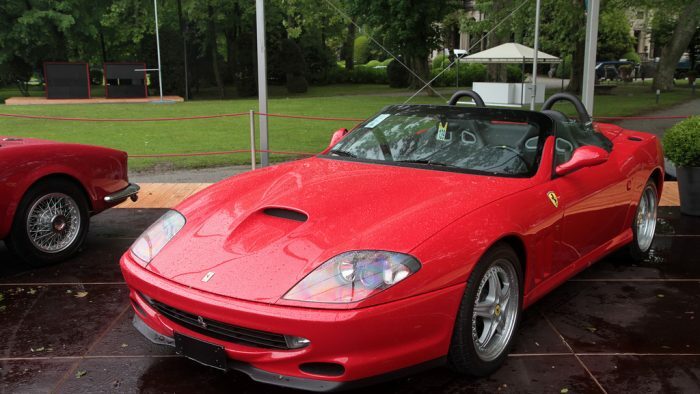 Unveiled at the Paris Show in 2000, the 550 Barchetta Pininfarina was so named to commemorate the 70th anniversary of Ferrari’s coachbuilder and stylist. A strictly limited edition of just 448 numbered cars was built, with the last leaving the factory in December 2001. The 550 Barchetta Pininfarina was specifically designed to be reminiscent of legendary Ferrari road race stars of the likes of the 166 MM, the 250 GT California and the 365 GTS4 Daytona. The aim, in fact, was to create an open-top front-engined 12-cylinder with a retro feel to it. The 550 Barchetta Pininfarina was designed and developed to be a unique interpretation of Ferrari’s purest and most extreme sports cars. In fact, it was a deliberate and provocative departure from the rest of the current range. As such, it was made available only as a limited edition. Each car was numbered and its number displayed on a special in-car plaque signed by Sergio Pininfarina.